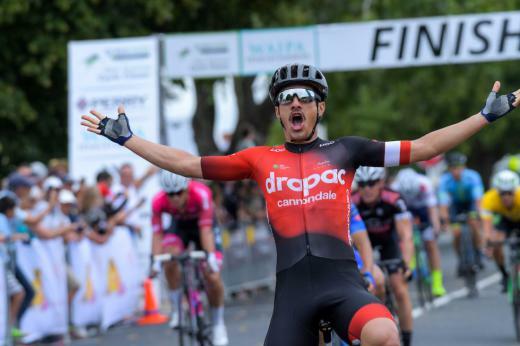 EVO Pro racing’s Aaron Gate won the overall Grassroots Trust New Zealand Cycle Classic title while another exciting sprint finish saw Drapac Cannondale Holistic Development team take first and second over the line in today’s fifth and final stage. Drapac’s Theo Yates crossed the line in first place in 3hr 20 secs 28 mins with Jensen Plowright second while Gate’s teammate Shane Archbold was third. EVO Pro’s top placing also saw them win the Cross Country Rental team classification jersey, capping off a terrific week for the Irish based team. Despite several early attacks this morning, a breakaway did not form until around 75km when four riders including defending champion Hayden McCormick (Team Bridgeland), Swiss National team, New Zealand and GPM Stulz. They extended their lead to over minute just over 100km to go. But with approximately 10km to go the breakaway was caught. Then St George’s Mathew Zenovich and Team Skoda Fruizio’s Joel Yates formed their own break away and things began to get frantic before Ethan Batt (NZ) and then Bridgelane’s Joe Cooper each made an attack of the front before Drapac thwarted their plans with the sprint finish, much to the delight of the large crowd at that lined the Cambridge square finish line.